The Big Dipper pops out into your northwestern sky on August evenings. On August 3, we star-hopped from the Big Dipper to Polaris, the North Star. Tonight, we star-hop to two bright summer stars: Arcturus and Spica. As shown on our sky chart, we extend the Big Dipper handle “to arc to Arcturus and to drive a spike to Spica.” Arcturus is the brightest star in your western sky, so you cannot miss this yellow-orange beacon. Blue-white Spica, the brightest star in the constellation Virgo, is nowhere as bright as Arcturus but it is still a first-magnitude star. This blue-white gem appears to the southwest (lower left) of Arcturus. 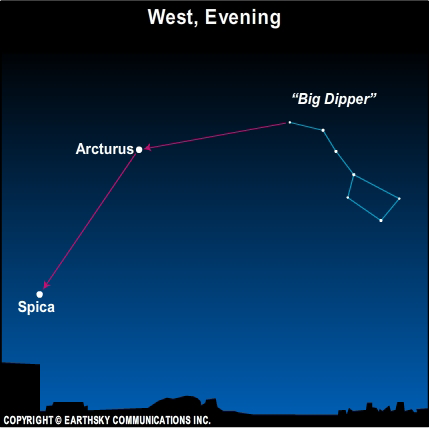 Spica and Arcturus descend westward throughout the evening hours. Spica sets beneath the west-southwest horizon by mid to late evening. Arcturus sets beneath the west-northwest horizon after midnight. These stars will appear in almost the same place in the sky at the same time tomorrow – but not quite! Spica and Arcturus set 4 minutes earlier with each passing day. Spica will disappear from the evening sky by late September, and Arcturus will disappear from the evening stage in November. 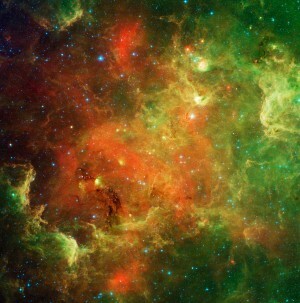 As these stars sink westward day by day, it is a sure sign of cooler weather to come! Site contents copyright © 2019 Recorder Online	except as noted. All rights reserved. | 88 queries in 2.137 seconds.